Linear Ball Bushings are stocked in various sizes to suit our entire Linear Shaft Bar range. We supply different types from standard, open and adjustable to flanged and stainless bearings. Standard linear bearings are suitable for applications that require low friction or high-speed movement. They can be supplied with a standard resin retainer or with a steel retainer for high temperature and vacuum. Shaft diameter from 5mm to 80mm. Standard closed, open and adjustable bearings available. Compact and double compliment bushings also available. Our higher load range has 27 times longer travel life compared to a standard linear bushing. They enable smooth operation and reduced maintenance as a result of self-aligning ball plates. Travel speeds of up to 10ft/s (3m/s). Range from open and closed. Can also be supplied nickel plated. You can choose from variety of designs and they are easy to install. Can be installed without a housing. Double compliment with centre flange available for higher load applications. Available for shafts sizes 6mm to 60mm. 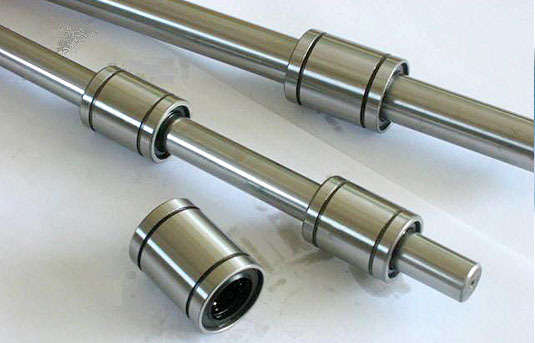 Bearings to suit shafts from 8mm to 50mm. These Ceramic bearings are designed to be used in environments where dirt or dust is a problem and can be used in temperatures ranging from -130° - +200°C. They can run on soft shafting which reduces cost. Standard and Self Lubricating ceramic bearings available from stock.